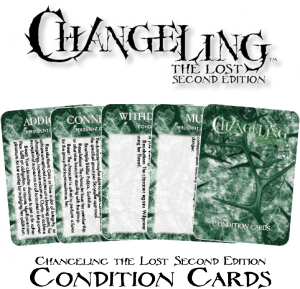 Now available from DriveThruRPG: Changeling: The Lost 2nd Edition Condition Cards! Part of the Changeling: the Lost 2nd Edition rules, Conditions add an additional layer of consequence and reward to certain actions in the Chronicles of Darkness. Various things within the course of a game can cause Conditions. These include exceptional successes, supernatural abilities, and really any situation where the Storyteller thinks they can be used to heighten the drama of a game. 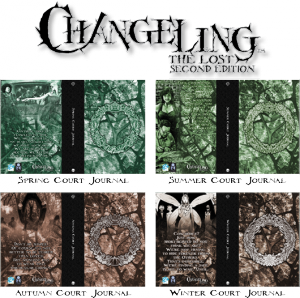 Also available from our RedBubble store: Changeling: The Lost Hardcover Court Journals. These journals are filled with blank pages (your choice of lined, grid, or full blank) for you to fill with character notes, chronicle notes, sketches, or whatever else you fancy. Our Kickstarter for a deluxe version of the upcoming Lunars: Fangs at the Gate for Exalted 3rd Edition launched yesterday and is now live! Exalted fans managed to hit our goal in a mere 39 minutes! 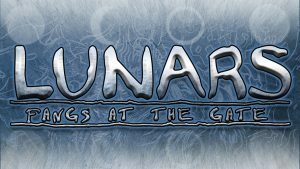 ◀ Kickstarter for Lunars: Fangs at the Gate is live! Condition Cards are always a welcome addition at my gaming table. The Journals are great, too. I’m a prime candidate for the Summer Court. Always will be. Just as a note, a lot of the quotes are cut off in the preview pictures.